Another day, another marathon as my wife put it yesterday. We were up very early to travel to Portsmouth for the 2014 Coastal Marathon. 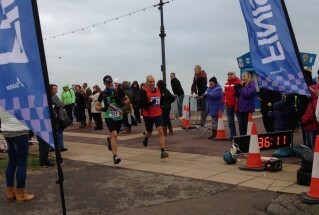 Portsmouth Coastal Waterside Marathon is a flat, multi-terrain marathon starting on the seafront at Southsea and running out and back to Hayling Island. Elsa and Ellis came along and we met Richard, Tanya and Leia when we got there. The children had a great time playing in the soft play area at the Pyramids Centre whilst Richard and I set off to run 26.2 miles along the coast around Langstone Harbour. It was rather cold, wet and gloomy outside and it wasn’t the most prestigious of starts. We had to walk to the start line at the pier. When we got there I decided to sneak off for a quick wee, only to discover the race had started without any countdown or hooter. There was just some guy standing at the timing chip mats saying “start when you like”! So I did. I have recently purchased a new running watch, which I love, but I’m still getting used to it. On more than one occasion I have failed to actually start the timer at the outset of a run or swim. You have to press the start button twice on the Garmin 920xt, once to select the correct mode (Run, Indoor Run, Ride, Outdoor Ride, Pool Swim, Outdoor Swim, Triathlon or custom setting) and then again to actually start the timer. With my old 910xt any time you pressed the start button it would start the timer regardless of where you were in the hierarchy of the watch. At least the GPS locks on a lot quicker. I had run around 3 miles when I spotted Rob Young, aka Marathonmanuk a few hundred yards up ahead. I had to speed up considerably to catch him, but when I did we had a good old chat on camera about what he’s been up to. In case you do not know, Rob has been running one marathon every day this year. I did not realise though, that he has been injured and this was his first marathon in a couple of weeks. So far he has completed around 242 marathons, but do check out his website or like his Facebook page to stay up to or find out more. I really enjoyed the first half of the run. I was bouncing along at a decent pace and feeling good. I chatted with various people and tried out some different angles to film on the GoPro. I nearly didn’t bring the camera, but I had, foolishly, expected the run to be a bit dull and thought having the GoPro with me might make it more interesting! It was good to chat with Emma Sawyer, who was running her second marathon. Her first was in Mexico City where she lives and works as a translator. The route is a real mix of terrains. The first 3 miles are along the promenade. Then there are sections of shingle beach, muddy path, a couple of bridges and some hard-pack towpath. We even run adjacent to the A27 three lane highway for half a mile! The race is out and back, so once you cross the bridge to Hayling Island and start down the Hayling Billy Trail, you know you’re not far off the turn. It’s also at this point you see the lead runners coming back past you. I managed to film the leader as he passed. Approaching the half way turn I saw Richard coming back. He was running really well. I was still doing ok. I was wearing my Salomon back pack so didn’t have to stop at any water stations. My nutrition was two sachets of baby food which I took at 9 miles and 19 miles. I also took 2 S-Caps every hour to stave off cramp and keep my salt levels in check. This all worked pretty well. It was great to spot my friends Mark Johnson and Shelley Harris as I was running back up the Hayling Billy Trail. Unfortunately I didn’t have time to get the camera out to film them.By 20 miles I was starting to slow down, but I didn’t stop and I certainly felt a lot better than I have done on many recent marathons. Once I got to 24 miles I was able to try and step up the pace a little and I even managed a sprint finish against Stuart Bradley runner number 196. He just pipped me! 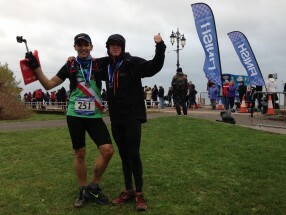 No PB this time, but the Portsmouth Coastal Waterside Marathon, my last marathon of 2014, and my 10th in total, was my fastest at 3 hours 35 minutes and 14 seconds.